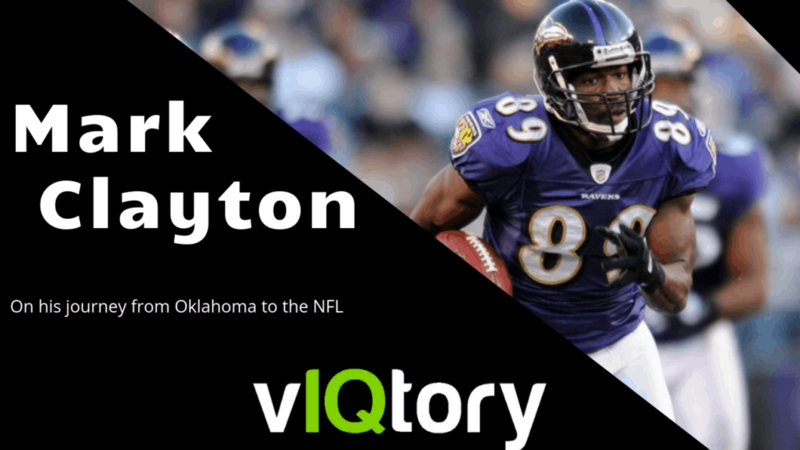 On this episode of the vIQtory podcast we are joined by 2x All American Wide Receiver as an Oklahoma Sooner, 7 Year NFL Vet and founder of LIVV Headphones – Mark Clayton. Mark talks to us about the Red River Rivalry, playing the receiver position, learning from a variety of different successful coaches in the NFL and his journey through entrepreneurship as the founder of LIVV Headphones. Welcome back, everybody to the victory podcast. I’m your host Steve McGrath. Alongside Chris had add, and today we have another special guest it is none other than Mark Clayton yes the two time all American out of Oklahoma all big 12 former first round pick to the raven seven year NFL career and the head of live headphones that you’re going to get into later. Mark, thank you so much for coming on with us. You know, the starting point that I really wanted to get into with you because it’s still kind of fresh and I’m sorry to bring it up. But the Red River rivalry this year was definitely a great game. You know, the fury that Oklahoma put on at the end to come this close to winning. I’m not that you necessarily have to break down this year’s game. But I just wanted to ask you, you know, being in that game, you know, what is that atmosphere like? yeah I can only imagine I live in Texas and I felt like the whole town shut down so I can only imagine what it was like playing in it but uh. So I just want to take a couple steps back. You know, could you walk us through when you’re you know a high school athlete I’m sure you have a couple options of where do you want to play here at the next level. How do you ultimately decided Oklahoma’s where you want it to go? Well, I was I was actually born in Oklahoma City and grew up about the fifth grade and then moved down to Texas, Arlington, Texas. And so there’s there was a lot of fool there. Excuse me from the family side. But you know, in high school watching like Barry Sanders and NFL. I didn’t watch college football. And so the first actual college football game that I wash and paid attention to and it was a Notre Dame when I first got there and Mike, recruiting coordinator. Yep. And so I was as I was being recruited, that was always you know, in my mind and receiver, you want to go to a place in 1998 or 1999 where they throw the ball with a lot of places but where they were, they threw the ball all the time. You felt like you had a chance you get some opportunity and so you know kind of a combination of those. And then Brett Venables was who recruited me and as these are your journey with the receiver coach and so getting to meet him and those are two polar opposite with various personalities and it was it was sweet to meet them and have them you know come up to me as a as a recruit. And that was that was you know all that combined with the reason why only became the place now. Who else you have on the table? Do you remember as far as recruiting wise was it was okay or just Oklahoma lead the way and you had your mind set on that the whole time? No. So it was almost Missouri! so in high school I was a play wide receiver essentially one game at the end of my junior varsity and then a my senior year we had a kid that year who was one of the top 10 players in Texas. So we got a lot of recruits coming in to see him and then our quarterback was a top quarterback in Texas and he ended up going to TCU. Then at the end of the recruiting process LSU came came in and that was when Nick Saban had just got the job so he had came out and that was that.That was the last school kind of that where I was like, man, I could be cool. Yeah. Unless, you know, you it really came down to and then Missouri was a kind of that’s cool. And just, you know, Steve mentioned all your accolades at the top of the show. I want to skip a little bit ahead here. Just it’s very interesting. The story. So talk about your quarterback Jason white. And,myou know, he, I have a stat here he became the third Heisman Trophy winner not to be drafted and the other two guys Pete Dawkins chose military career and Charlie Ward chose the NBA. So essentially, he’s the only guy to just not get drafted. Why do you think that was? Is there anything? I guess that stuck out to you? Because, I mean, he won the Heisman he put it up here. Yeah, I just wanted to give you the floor for that. And just to give you a thoughts on that. Yeah, I think a lot more to do with his injuries. Okay. Anything to turn a CEO .Going to camp with the titans and sure enough he retired quick because of his knee of what’s well up and he can take his draw can take a drop. so skip ahead here just a little bit more, You get drafted by the Ravens – what was the biggest thing, I know we actually just talked in the positional segment, what was it like going from high school to college let’s talk about going to college to the NFL now what was the biggest adjustment scheme wise going from college to the NFL? Mental IQ! As you know everybody’s fast and strong, you gotta do you there because you got your at your part is the mental aspect of it and understand it not only your scheme but there’s game and then and then you know how to you know you guys are going to try to take advantage of that and then plan the games that are you know within the game. consuming knowledge before you step foot on a field. Deion Sanders was in his last year where he was his jersey number was his age. but our like our secondary had chemistry yeah yeah yeah I’ve been here first like , their signing major deals like $70 million deals as a defensive back and I mean that defense or special and I got to learn and listen to those guys talk about you know how they look at receivers and what they look for. in route running and what gives them you know cues and let them know because every one day one I was trying to count my rookie year Chris McAlister playing man off about 8 off yards as a corner. and for me I’m my office as opposed to be for the ground and now this look at me trying to sell the post move like a like a comeback. He’s looking at the quarterback the whole time, like, I knew you were going to post shoulders never made it down and back. That’s pretty It was fun and Billick’s first year as coach we left at 3pm why we couldn’t be there after. okay somebody came in you know good our practice and why was that is that just the he just wanted guys to maximize the time. Well he wants guys doing going to do what we have to do and we’re going to go hard and they were going to go home okay and we’re going to you know enough is that you know in a bunch of time or extra you know. this is by far the funnest season we ended up 13 and three that year and then we lost to peyton. But yeah, I mean, it was just been around. Yeah. it’s definitely not so much that as much as it is, Hey, this is this is your job to get paid to do and if you’re not doing a good job for somebody else to do the job and we’re and at the same time there’s somebody who’s coming after you’re done. Yeah. And you know, so it’s a level of pressure to perform. We get it. So today but it’s it’s something that decreases with for sure. I just wanted to ask you, you know your time in Baltimore. You come in at a time where Brian Billick had won a Super Bowl. But he’s still with the Ravens. And then, by the time you leave, Harbaugh’s, the coach who after you’re no longer with the Ravens goes on to win a Super Bowl. But you were kind of there for the end of an era beginning of a new era. And so just in terms of the coaches, but, you know, Ed Reed Ray Lewis a lot of the holdovers from the first regime you still played with. Yeah, you know, what was it like just looking at those two head coaches? Why do you think they’ve both been successful? Bart Scott is playing better than Ray Lewis right right you know the Bart’s got it but my own like this is a BS and as the did a great job of hat like just finding these guys and just town and continually given you know the coaches and saying you know Harbaugh come in and take over was an interesting transition to because I will have a more of a kind of college mentality. So that I mean our was a heck of a transition. you know, what happens in these years there, there’s some give on the player sound like totally fine, you got to communicate with us and vice versa. I want to switch more of the offensive side here and you played under Pat. Schurmer and Josh McDaniels, two guys were still coach in the NFL. Yeah, what made them special? Schirmer was really I mean what’s this okay to me was awesome. was leaving Baltimore where, you know, our deal was cater to the defense and just no mess up. It was the what are we doing is wrong we don’t worry about it and they’ll come to you are you gonna be ready to play? Absolutely. And so essentially the first game that I play with remember that I mean, I think we did about 15 times and that was just we’re just going to go go, go, go, go. Go. He was real laid back his personality and he wouldn’t fire anything like just an island. I’m receiver right like can catch it! And I wish you know from a injury standpoint I was able to recover better than I did not really get to spend time playing that often system maybe even get better. It gave me me a better understanding of defense and then you know how to expose defenses. when you say this complex Do you mean the sense of terminology? Do you mean sense of like you have to understand what the defense is doing because you got to run this specific route and you know is that like the complex terminology? yeah yeah absolutely It was so certain offices are concepts when when we’re a bunch of things yep and then you know there’s over 60different mission your protection 600 whatever it is and then there’s a combination of both and so his his was it was it was all of the above. In so it was concepts and it was number system is kind of like West Coast so there was no you know it just dependent on a week where he would pull from the flavor it was going to take his place that I you know dealt with it. alright well mark as promised a I want to transition over to what you’ve been doing after your NFL career, LIVV brand headphones I know they look like they are just you know next level so can you just tell me a little bit about like how did you develop that idea and how did you you know ultimately make the strides that you’ve made where it looks like it’s you know a top level product and you know you’re out there competing with you know the Beats of the world and Bose? well yeah we’re not much a blip on the map and compared to those two but the concept started with and I was running route through game and I do have my my beats on and you know they would slide and it just apparent you know, fall off and snap and i I love the over your head phones and so my thought process was hey I don’t if I could figure I can make it over your head on that that will just stay on my head and be more secure than this one? So that’s where in high school I didn’t think I was actually going to go to college football about our go to the service and try to be an engineer kind of put my engineering hat on about have a headband concept to that I thought would allow for and we sketched up something that what you’re seeing now we go to live with headphones. We created these a partner of mine l and so getting that and testing it and seeing the results just kind of stuff. Like, you know, really pursuing it and had that on on one on to spend time in China to produce and development and so now we’re three years into it and this last round of your launch and and we sold about thousand units I did a crowd-funding we did about $100,000 in 30 days and the goal was to was to have this be, you know, r&d for us where we can learn and you know, I knew it was like, you know, I know how to run routes but I don’t know how to do have phones. We started with and you know, same patient, just a lot of those things and I tell people you know about let their kids in sports just there’s so many invaluable aspects of sport that just cross over to doing life on a daily daily day to day basis. And so a lot of that has been really big and in helping me, you know, get through this process and continue in this process because there’s been a few times I’m like, Man, I’m just gonna shut it down and call it quits because it’s rough and it’s expensive, you know? Well, obviously, you know, we wish you the best of luck. Wow, will definitely be supporting live Li Vi Vi for all of our listeners. But before we wrap this up, we have to have you run through the gauntlet one last time. Just a couple quick questions for you where we need to know your knee jerk answer. John Fox. Got to meet him a couple times and he was it was just fun loving it was fun loving dude like so like I would have connected really well with him. fair enough you got put on the island. Have a specific pregame ritual that you stuck to? and it was just these moments and you know at that time was like these are not this is not you know real life is not gonna last so really it was do a job you know spend time with God just soak in that moment time knowing that they wouldn’t last and then stretch, stretch, push the movement. And the last one before we let you off the hook, what’s most important the players or the scheme? all right there you have it. Mark, thank you so much for coming on with us. We really appreciate you taking the time to update us on how LIVV is Doing and everyone just go to. Is it live headphones calm? Thank you for talking to us updating us on that. And just given us the overview of your Oklahoma days in the NFL stuff. We appreciate it.